VANCOUVER, British Columbia, Oct. 25, 2018 (GLOBE NEWSWIRE) — Namaste Technologies Inc. (“Namaste” or the “Company”) (TSXV: N) (FRANKFURT: M5BQ) (OTCMKTS: NXTTF) is pleased to announce that it has closed today its previously announced “bought deal” short form prospectus offering of units, including the exercise in full of the over-allotment option (the “Offering”). A total of 17,250,000 units of the Company (“Units”) were sold at a price of $3.00 per Unit (the “Issue Price”) for gross proceeds of $51,750,000. The Offering was completed by a syndicate of underwriters led by Eight Capital and Canaccord Genuity Corp. as co-lead underwriters and joint bookrunners, and including Laurentian Bank Securities Inc. (the “Underwriters”). Each Unit was comprised of one common share in the capital of the Company (a “Common Share”) and three-quarters of one Common Share purchase warrant (each whole warrant, a “Warrant”). Each Warrant entitles the holder thereof to purchase one Common Share at a price of $3.15 until October 25, 2023. In consideration for their services, the Underwriters received a cash commission equal to 6% of the gross proceeds of the Offering and compensation options (each a “Compensation Option”) equal to 6% of the Units sold pursuant to the Offering. Each Compensation Option entitles the holder thereof to purchase one Unit at the Issue Price until October 25, 2023. The net proceeds of the Offering are expected to be used by the Company for inventory and supplies, capital improvements, personnel and facility operations, integration and expansion of e-commerce platforms and customer bases, and for working capital and general corporate purposes, as more particularly described in the Company’s final prospectus. The Offering is subject to TSXV final acceptance of requisite regulatory filings. This press release shall not constitute an offer to sell or the solicitation of an offer to buy nor shall there be any sale of the securities in any state in which such offer, solicitation or sale would be unlawful. The securities being offered have not been, nor will they be, registered under the United States Securities Act of 1933, as amended, and may not be offered or sold in the United States absent registration or an applicable exemption from the registration requirements of the United States Securities Act of 1933, as amended, and applicable state securities laws. 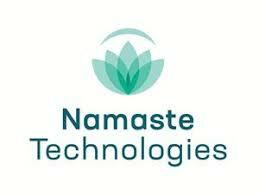 Namaste Technologies is Your Everything Cannabis Store(tm). Namaste operates the largest global cannabis ecommerce platform with over 30 websites in 20+ countries under various brands. Namaste’s product offering through its subsidiaries includes vaporizers, glassware, accessories, CBD products, and medical cannabis through its wholly owned subsidiary CannMart in the Canadian market. Namaste has developed and acquired innovative technology platforms including NamasteMD.com, and in May 2018 the Company acquired a leading e-commerce AI and Machine Learning Company, Findify AB. Findify uses artificial intelligence algorithms to optimize and personalize a consumer’s on-site buying experience. Namaste is focused on leveraging its cutting-edge technology to enhance the user experience throughout its platforms. Namaste will continue to develop and acquire innovative technologies which will provide value to the Company and to its shareholders as well as to the broader cannabis market.